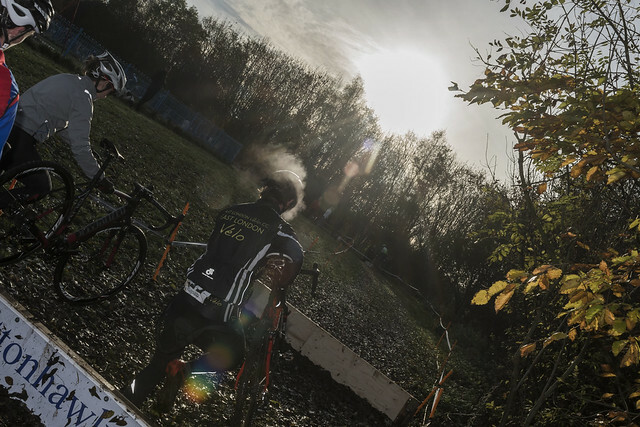 Hannah Payton (Kinesis UK) and Ian Field (Hargroves Cycles-Ridley) were the elite winners as the British Cycling National Trophy Series headed to Hetton Lyons Country Park near Sunderland for round three. Field took a relatively comfortable win in the men’s race and crossed the line 48 seconds ahead of rival Yorben Van Tichelt, while Payton needed to sprint to take the win in the elite women’s race, holding off Beth Crumpton (Boot Out Breast Cancer) by the narrowest of margins. While Field and Van Tichelt would eventually dominate the race, it was Billy Harding (Oldfield-Paul Milnes) who set the early pace, leading the race up the tricky run up climb out of the arena and into the top woods. Van Tichelt appeared first as the race descended back to the main part of the circuit with Harding and Field a handful of bike lengths behind. As in previous rounds, it was Field and Van Tichelt who set out their stall as the race settled, the pair once again dominating the head of the race. But Harding was riding above his Under 23 status and was still contention with the leaders, while Hope Factory Racing’s Paul Oldham had found a turn of speed and was beginning to nibble at Harding’s third spot. The pits were playing a part in the race, arguably for the first time this season. Field opted for a bike change whilst Harding and Van Tichelt took the opportunity to pass the race leader. The trio were soon back together but by the mid-way point, Field had regained the lead and the pace saw Harding slip back but still holding third. Oldham’s pace was relentless and soon he would have Harding in his sights. With another lap off the lap board, Oldham’s pace meant he caught and passed the Under 23 leader while Dave Fletcher (Sherwood Pines) was also on a charge and he too was after Harding. Jack Clarkson (Hope Factory Racing) and Nick Barnes (Hargroves Cycles-Ridley) were having a battle Royale for sixth and seventh, a tussle that would last to the line where Clarkson had to surrender to Barnes and Lewis Craven (Wheelbase-Altura) who had worked his way through the field. With two laps remaining Field had worked over Van Tichelt and got the gap over the Belgian, while Oldham was still chasing second place down - but it wasn’t to be and he had to be content with third on the day. 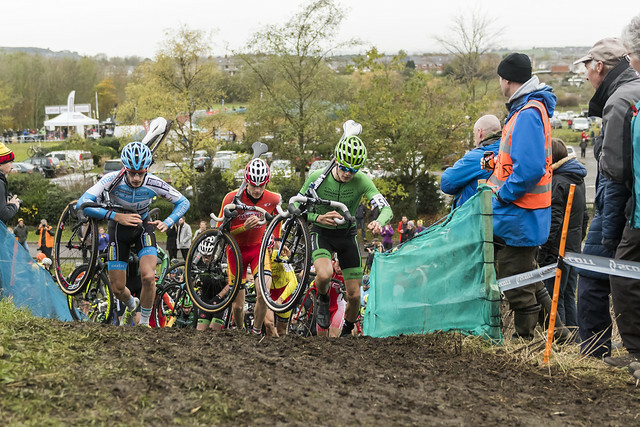 Field, knowing he had a safe gap over Van Tichelt cruised the final lap to take the win whilst Fletcher found the speed to take a fine fourth from Harding who took his third win in the under-23 category. “There was a run up and a rideable climb and there’s a really muddy left hander and it kicked up slightly, and I got a little gap there almost every lap, I kept the pressure on after that bit for a couple of laps and I think that cracked him," said Field. “The downhill was really technical and with the rain coming down the bottom section turned into an ice rink - Elite Men's winner Ian Field. Hannah Payton (Kenesis UK) took her second win in the British Cycling National Trophy Series to retain the overall, but it would prove to be a hard-fought victory after a race-long clash with Beth Crumpton (Boot out Breast Cancer). It was Crumpton who pushed the early pace, breaking away on the top section of the course through the woods, leaving the rest of the field having to work hard to chase her down. Payton, in yellow, was some bike lengths behind and having all the work to do. Ffion James (Abergavenny RC) was third and Hope Factory Racing’s Annie Simpson was fourth. The big battle was at the head of the race, Payton and Crumpton have raced each other for many years both at National and International level and arguably having the measure of each other. 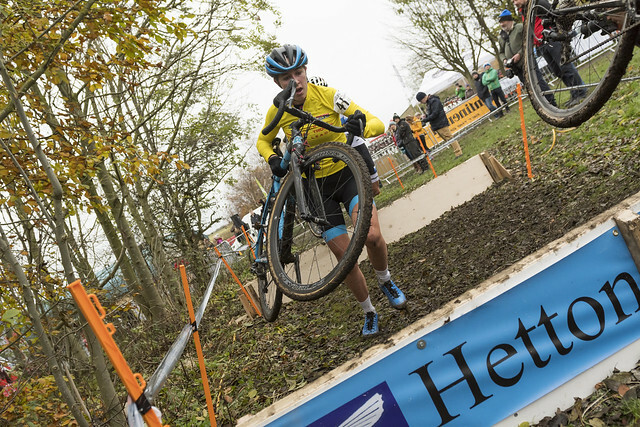 But with Payton having a season of road racing in her legs, the course at Hetton looked to be leaning towards the Kinesis UK rider and by the mid-point she had taken the lead. James was sitting in third place and Simpson was still fourth, but a spirited ride by Emily Wadsworth (Beeline-Gener8) saw the Junior sitting in fifth place, the position she would carry to the finish. By the penultimate lap Crumpton had worked her way back up to the leader and the pair were locked together. Crumpton took the lead coming into the last lap, and the pair had some 90 seconds to the rest of the field. The result would only be decided in the final twist, and it was Payton who got there first, giving her a clear run to take the chequered flag by a few feet. “It was super close, the closest one this year,” said Payton. “Beth [Crumpton] started fast as she normally does and after that we found ourselves together. I got a lead of about 10-12 seconds but I couldn’t get it up any more than that. Nick Craig (Scott Racing) took his second win of the Series to retain the leader’s jersey after a close battle in the Over 40 veterans race. It was Ian Taylor (C and N Cycles) who made the early move, jumping away on the opening lap and getting a useful looking lead over Craig, Dan Guest (Cotswold Veldrijden) and a Hope Factory pair of Rob Jebb and Dave Collins. As the race progressed it was Taylor, Craig and Jebb who forged ahead, the trio well away by mid race. The race settled into a rhythm for the closing laps with Jebb and Craig taking the bell together. The final time over the hurdles Jebb slipped, allowing Craig to steal a few bike lengths which proved enough to give the Series leader the edge. But Jebb recovered and the pair fought it out until the final few metres with Craig taking the sprint to the line. Pete Middleton (Zepnat RT) held off Chris Young (Pedalsport CC) to take his second win of the Series in the Over 50s veterans race and so retaining his overall Series lead. Middleton took the initiative from the gun and went to the head of the race, leaving the chasing field with work to do. Young took second whilst the battle for third was between Richard Cross (Stroud Valley Velos) and Phil Roach (Team Jewson-MI Racing), Cross just taking third and therefore second in the Series. Maddie Smith (Bolsover & District CC) took the win in the Veteran Women’s race. She took an early lead from Isla Rowntree (Islabikes) and never relinquished it, taking the overall Series lead from Rowntree in the process. Helen Pattinson (Solent Pirates) completed the podium. Harriet Harnden (T-Mo Racing) made it three wins from three races in the Under 16s girls’ race. Harnden made her move on the opening lap and wasn’t troubled throughout. Maddie Wadsworth (Beeline Bikes RT) took second and her best result of the campaign whilst Amy Perryman (Solent Pirates) rode a great race to take third and her first podium. In the Under 14 girls race it was Millie Couzens (Zappi’s CC) who once again dominated the race to take her third win of the Series, while Anna Wadsworth (Beeline Bikes RT) and Charlotte-Louise Mcgreevy (WXC World Racing) took second and third respectively and so maintaining their positions in the Series. Charlie Craig (Scott Racing) took his first win of the series in the Under 16 boys race to retain the yellow jersey. It was Craig and Oliver Draffen (Derwentside CC) who took the early initiative, jumping away on the opening lap, the pair shoulder to shoulder for the majority of the race. Ben Tulett (Beeline Gener8) gave chase but overcooked it coming into the hurdles, slipped and lost precious time, allowing a chase group of Lewis Askey (RST Racing), Joe Pidcock (Paul Milnes Bradford), Marcus Holmes (Lichfield CC) and Alec Gregory (Leicestershire RC) to bridge the gap. The group worked well together but the leader pair weren’t going to be caught. In the closing laps Draffen blew and Craig attacked to take the final lap alone, Draffen held on to second whilst Askey moved away from the chasers to his first podium of the series. In the Under 14 boys race it was another victory for Finlay Pickering (Hull Thursday RC) who retains the Series lead. Joe Kiely (Welwyn Wheelers CC) took second and Max Poole (Bike Box Alan) took his first podium in the Series finishing third. European Junior Champion Tom Pidcock (Oldfield-Paul Milnes) all but rode a demonstration race to take the win in the Junior race and secure the Series lead. Pidcock took the lead on the opening lap once past the bottleneck of the run up and only looked back to check the gap. Dan Tulett (Specialized Racing) gave chase but really had no answer to the newly-crowned European champion on the new Hetton Course. North East Series regular Thomas Mein (Derwentside CC) completed the podium, much to the cheering crowd’s pleasure, after a race-long tussle with Lichfield CC’s Toby Barnes and Sam Moses (Oldfield-Paul Milnes).